Afghanistan's team manager says his country has the potential to join the elite of world cricket, if given the opportunity to play more games. 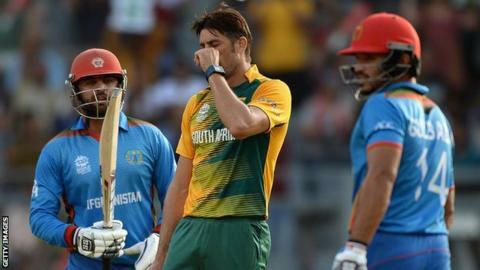 Having won their qualifying group in India, Afghanistan have lost their two games in the World Twenty20 so far but were competitive in both, making scores of 153 against Sri Lanka and 172 against South Africa. Shir Agha Hamkar told BBC Sport: "You can see the difference compared to the last World Twenty20. The guys are performing very well, they have played very good cricket. "It's true that we haven't won matches, but we have won so many hearts in this tournament. We are watching social media, Facebook and Twitter. The people are so happy after the last game with the way we played, even though we lost." But Afghanistan have gone beyond the stage of simply creating goodwill, they have two matches left and firmly believe a victory is possible. The first opportunity is in Delhi against England on Wednesday. "We saw their last game, they are a good batting team and have good all-round strength in their team. You cannot take a full member team as an easy team but the way these Afghan players are playing anything is possible," said Shir Agha Hamkar. "Our team is vey much unpredictable, we can do anything at the end of the day, but our full focus is on at least one win, that's England or West Indies. We are here not only to play good cricket but to win." The broader aim of Afghan cricket is to be taken seriously by the International Cricket Council on a par with full member nations. Shir Agha Hamkar points out their recent results demand it. "Against Zimbabwe, who are full members, we have played two Twenty20 series and two ODI series. We have won all four of them," he said. "With one game you can't compare yourself with a full member team, we need series with these full member teams. If you only play with associates you will only beat associates. The ICC are giving opportunities, it depends on their budget, resources, how much they can provide." Like the other leading associate nations, Afghanistan face an uphill struggle to secure fixtures against the leading countries because the next 50-over World Cup, in England in 2019, has been reduced to just 10 teams. "There should be more teams, not just limited to the 10 full members because there are teams which are close to full members, so let's give them a chance to come forward because they have the potential to compete at elite level," the Afghanistan manager added. "We have the potential to play at the elite level. So I think if the ICC can consider in the next World Cup, T20 or 50 overs, they have to increase the number of countries and give more of a chance." Those frustrations will be echoed in Ireland, Scotland and other ambitious associate nations. But Afghanistan is a country of more than 30 million people where, according to Shir Agha Hamkar, cricket's appeal is growing rapidly. He says there are already two cricket grounds with capacities of 15,000, and three more are under construction. "It's a big craze of cricket in Kabul but we have 34 provinces and you will now find cricket everywhere. There are very limited resources in some provinces but you can still see lots of cricket," he said. "We have T20 tournaments at school level and club level, everything is coming up. You can see Rashid Khan, the 17-year-old leg-spinner, he was produced by our domestic cricket and he's bowled well in this tournament. "The main thing behind our cricket is that we are not just depending on a few players, there are a bunch of players who can play for Afghanistan in the future." One aspect of cricket that will hinder Afghanistan's progress and recognition with the ICC is the women's game, as female participation has struggled to make any headway there. When asked if he could ever foresee an Afghan women's team playing in the World T20, Shir Agha Hamkar admitted: "It depends. We are still not at that level in Afghanistan where we can provide facilities. "We do have a women's team playing in Afghanistan, there are teams playing school-level cricket and some small indoor academies. But it will take some time to get to that stage." You can hear more on cricket in Afghanistan on this week's Stumped on BBC World Service at 00:30 GMT on Saturday or download the podcast.